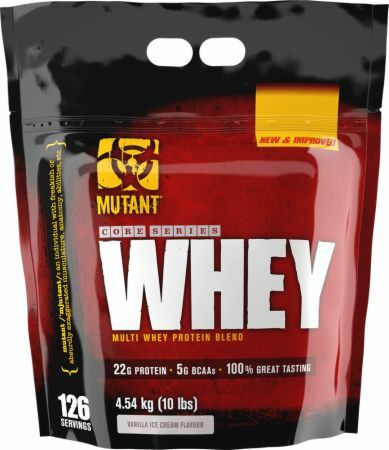 Whey by Mutant at Bodybuilding.com - Best Prices on Whey! Extreme Multi Whey Mega Blend! Fast becoming regarded as the ULTIMATE whey protein blend, MUTANT WHEY is a unique 5-Stage Whey Protein that supports muscle growth and the maintenance of muscle mass1. MUTANT WHEY has been developed after 28 months of dedicated research. It is the world's first protein to use specially selected proteins, each with their own unique uptake rate. What does this mean? It simply means better quality nutrients to support your muscle building goals! Each of the 5 whey protein sources are 100% complete and rich in nutrients to support muscle growth1. MUTANT WHEY is all about gaining rock hard muscle 100% and helping to maintain all the hard earned muscle you have already acquired. The MUTANT WHEY formula is like no other you've ever tried. [Providing Naturally Occurring Critical Bioactive Compounds including Di, Tri and Oligo Peptides, Beta-Lactoglobulin, Alpha-Lactalbumin, Serum Albumin, and Immunoglobulins]; This is the new "Platinum Standard", considered to be more effective than normal whey isolate – #1 for nitrogen retention. Q: What percentage of protein is in MUTANT WHEY? A: The percentage of protein in MUTANT WHEY is 70%. Q: Can I take MUTANT WHEY with MUTANT MASS? A: Yes you can take MUTANT WHEY and MUTANT MASS together, along with any other of our MUTANT products. Q: What is the best way to mix up MUTANT WHEY in a shaker cup? A: The best way to mix MUTANT WHEY in a shaker cup is to put water into the shaker cup first, then add 2 scoops of MUTANT WHEY on top. Shake it up vigorously for 30 seconds. 1. Protein contributes to the growth and maintenance in muscle mass. This stuff is horribly sweet. I don't have a lot of sugar in my diet (as I'm sure most people who work out don't) so it's even more of an onslaught for the taste buds. Considering the sweetness is from added sweeteners it's just unnecessary chemicals in my protein. I generally like Mutant products but I'm struggling with this one, cut the sweeteners in half and it would probably be all right. 4 Whey Protein Blend (from Milk: Whey Protein Concentrate, Whey Protein/ Phospholipid Concentrate, Whey Protein Isolate, Hydrolyzed Whey Protein), Medium Chain Triglyceride (MCT) Powder (Fractionated Coconut Oil, Maltodextrin), Barley Fibre, Inulin, Thickener: Guar Gum, Natural And Artificial Flavours, Emulsifier: Sunflower Lecithin, Salt, Sweeteners (Sucralose, Acesulfame Potassium, Purified Stevia Leaf Extract), Enzymes (Lactase, Protease), Cinnamon, Flavour Enhancer: Potassium Citrate, Antioxidants (Ascorbic Acid, Vitamin E Tocopherols). ALLERGY ADVICE: For allergens, see ingredients in bold. Produced in a facility that also handles ingredients from wheat, egg, peanut, soya, nut (hazelnut). Directions For Whey: Add 1 level scoop to 170-227 mL (6-8 fl oz) of cold water, shake vigorously for 10 seconds, and slam it back! Warnings: This product is intended to be used to supplement the diet; not to be used as a substitute for a varied diet. A varied and balanced diet and healthy lifestyle are essential for good health. Do not use if packaging has been tampered with. Packed by weight, not by volume. Settling of product occurs after filling. Keep out of reach of children. Do not exceed 10 servings per day. Store in a cool, dry place. Food Supplement with 4 Whey Proteins, Amino Acids, and Sweeteners. Distributed in the UK by: Tropicana Health & Fitness, LTD. Unit 38/39, Minworth Industrial Park Sutton ColdField West Midlands B76 1AH.